A devoted husband, son, brother, and uncle, Adrian affected countless lives as an inexhaustible advocate and inveterate seeker of solutions and connection. Deeply committed to economic, racial and social justice, Adrian dedicated his life to providing affordable housing, shelter for the homeless and dignified conditions for those in need. Adrian was born March 16, 1979 in Belize City, Belize, the oldest of five children. Affectionate, light- hearted, and sensitive, Adrian also worked to cultivate his personal brand from an early age. Insisting to his mother that his Catholic school’s uniforms of brown and yellow button-downs and slacks just didn’t reflect his style, he struck a compromise. From that point on, Adrian was the only boy at school wearing yellow Lacoste polo shirts. Adrian’s younger siblings capitalized on his giant teddy bear demeanor, conspiring against him in surprise offenses in which they would hide before jumping to tackle him. Eventually he would gain the upper hand, and the encounters generally ended with him sitting on his brother and sisters until the chaos subsided. More often though, it was Adrian orchestrating the antics. He knew his mother’s gift-hiding spot, so each year before Christmas, he would take turns launching his siblings into the air and onto the the top shelf of their mother’s closet where they would survey the bounty and report it back to him. At age 16, Adrian and his family moved from Belize to Evanston. At 18, his father died. The two were very close, and the loss was particularly hard on him. Nonetheless, he took his new man-of-the-house role very seriously, and his youngest sisters remember him as a protector and father-figure, taking them to buy school supplies and softening disciplinary blows over poor report card scores or getting their mother’s makeup. Adrian was a pioneer in the burgeoning online world, and in 1997, that meant chat rooms. It was there that he met Cindi Dingman, a fellow high school student living in California. The two connected so deeply, that he’d asked her to marry him before they’d ever met in person. From first chat, the two were inseparable, moving from chatroom to telephone back to chatroom. When Cindi’s mother, alarmed at the family’s $1000+ long-distance phone bill, took away her phone, the two resorted to daily letter writing. And of course, their chat room. When Adrian graduated from Evanston Township High School in 1997, he went to visit Cindi in California, telling his mother he was headed to a conference. After Cindi graduated, she moved in with Adrian—and his family. They would eventually move to Rogers Park, and then into a Reba’s Place affordable housing unit so they could save money to purchase their current home in the Fifth Ward. They married in 2002. After high school, Adrian attended Oakton Community College and Colorado Technical University, initially majoring in political science. He worked for more than a decade at Grainger, where he was in charge of on-boarding, project management and disaster planning. The Fortune 500 Company developed an informal corporate motto of “What would Adrian do?” Upon his departure 12 years later, colleagues bid him farewell wearing T-shirts and holding mugs emblazing the slogan. 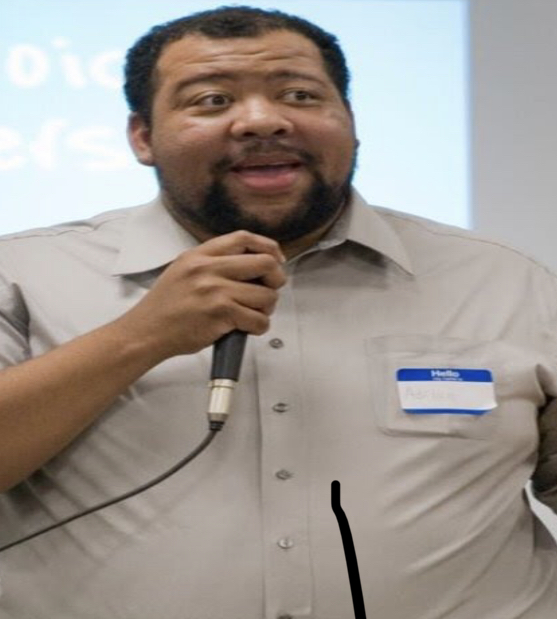 In addition to his full-time work, Adrian was actively engaged civically, serving as a member of Joining Forces for Affordable Housing—Connections for the Homeless, Interfaith Action of Evanston, running multiple political campaigns simultaneously, and was involved in various advocacy and consultant work. Adrian’s interest in global and local politics was likely sparked by his uncle, Stuart Leslie, who served as the Belizean Representative to the United Nations, Chief Elections Officer, and Ambassador of Trade in the Ministry of Foreign Affairs. A man of faith, Adrian was a parishioner of Vineyard Christian Fellowship of Evanston, and he modeled those values in his life. He believed God had a purpose for each and everyone of us, and that it was up to us to strive to identify and embrace that purpose. “Do the best you can, with what you’ve got and where you’re at.” Adrian modeled those guiding principles on a daily basis. His neighbors remember he seldom missed an opportunity to offer a “hey neighbor” or “good morning,” as he drove past. Always brimming with his infectious smile, always willing to take the time to chat. Always ready with a big bear hug. To Adrian, life was an event, which meant parties were an extravaganza. “Adrian always wanted to be in the mix of everything, and would find a way to take the lead of organizing events,” his siblings recall. If one mentioned a party, within the hour Adrian would’ve secured the venue, food and activities, all personally customized. For his nephew who loved nerf guns, Adrian drew diagrams of a nerf competition field, complete with blacklights. A consummate host, Adrian loved to take care of people. “Your cup would never run dry with Adrian,” friends and family remember. Even at his in-laws’ Thanksgivings, Adrian would take over the kitchen, keeping everyone else out. At the end of the meal, he would ensure everyone left with a plate stuffed high with leftovers. Adrian especially loved the holidays: doing all of the decorating, hosting Easter brunches and ensuring endless Christmas gifts and stocking stuffers. Summertime meant the annual Willoughby summer party, yearly pilgrimages to Myrtle Beach and camping trips with friends. Of course, Adrian always situated himself as chief organizer, planning menus and packing extra provisions for his friends. One particularly chilly summer, when Adrian’s three camping heaters blew his electrical circuitry, he rebraided the wires to ensure everyone was kept warm through the night. Adrian thrived on preparation. Nuclear War? Check. Zombie Apocalypse? Check. Backpacks were always at the ready, filled with emergency survival kits, and he provided radio individual passwords to every member of his family, just in case a cyber attack were to compromise the communication grid. In addition to entertaining, Adrian was a fervid White Sox fan and loved spending time at his lake house looking over the water, just as he’d done as a child. According to his mother, he had a “fondness for old ladies,” and would spend hours chatting with them at the Levy Center. He also loved animals, particularly cats, of which he and Cindi have three: Constance, Riddick and Lynx. Adrian is survived by his wife Cindi-Marie Willoughby; his mother Judith Willoughby; siblings Deven Harmon, Andrew Willoughby, Desiree Miller and Megan Levy; brothers-in-law Jeff Dingman, Reggie Harmon, Patrick Levy and Eugene Miller III; nephews Wayne Levy and Reggie Harmon; and nieces Maddie Harmon and Azyra Tuggle. He is preceded in death by father Wayne Willoughby, grandfather Lindy Leslie and father-in-law William Halver Dingman. All those whose lives Adrian touched are invited to a Farewell Celebration of his life on Saturday, Feb. 2, at Reba Place Church, 620 Madison St. in Evanston. Attendees are asked not wear black, and to come in casual attire. Witty, zany and irreverent T-shirts welcomed.